ALASKA AIRLINES’ PRAYER CARDS – WHO’S OFFENDED? Alaska Airlines is my favorite carrier. They have great customer service, an extremely generous mileage plan and routes to the places I regularly travel. For the past 30 years, Alaska has handed out prayer cards with its meals. They were simple cards quoting passages from Psalms printed over lovely photographs. Since 2006, when the airline stopped offering meals to customers in the main cabin, the cards have only appeared on meal trays in first class. Well, not anymore. Alaska has made a business decision, starting in February, not to include the cards with meals. Why, you ask? Apparently, it used to receive more positive than negative comments but the times, they are a changin’. The tide has turned. Airline spokesman, Bobbie Egan, said, “After carefully considering all sides, it was agreed that eliminating the cards was the right thing to do. “Religious beliefs are deeply personal and sharing them with others is an individual choice,” said the email I received signed by both airline CEO Bill Ayer and President Brad Tilden. The email said some of its customers enjoyed the cards but others were offended by them. Now I understand this was a business decision made by Alaska Airlines. That’s fine. But, really. C’mon. Someone is actually offended by a card with a prayer on it? If you don’t like, turn it over, or put it in the front seat pocket. Or give it back to the flight attendant. I’d really like to know who is offended by this gesture. I’m not sure if the “offended persons” believe in God but statistics now show the percentage of non-religion affiliated people is on the rise in this country. There are still five million Jews in this country and the majority of Americans still identify themselves as Christians. So, who, exactly, is opposing this innocuous little card quoting from the Old Testament? Apparently a small minority of people who are the most vocal and who are successfully imposing their will on the majority, that’s who. Even if someone doesn’t give thanks to God or a higher power for their food, isn’t this a quiet reminder to at least thank the flight attendant for bringing the tray? I’ve seen many people accept their food and not say thank you to the flight attendant – both in first class and in the main cabin. And people don’t think there is a secular war aimed at religion in this country? Every day I read about another battle being waged. The President recently attempted to mandate that religious employers, opposed to most forms of birth control, cover contraception in health plans – a direct attack on the First Amendment and religious freedom. Pressure is placed on retailers to prohibit their employees from saying “Merry Christmas” to their patrons. Just this past month, the Department of Education of NY has banned local church congregations utilizing space in the state’s public schools for services even though the congregations pay rent. And the battles go on and on and on…. 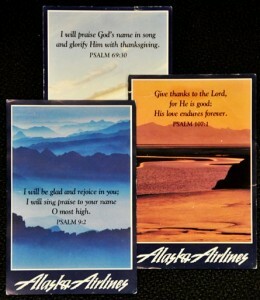 And with the elimination of Alaska Airlines’ prayer cards, chalk up one more for the secularists. Unfortunately, I get where to this going….